Emdad Rahman : A packed house at The Venue in Forest Gate broke their Ramadan fast together in an event organised by the Beanibazar Welfare Trust UK. Notables in attendance on the night included Mayor of Newham Rokhsana Fiaz OBE, Rushanara Ali MP, and Labour London Assembly Member Unmesh Desai. Guests were welcomed by Delwar Hussain, President, Mahbub Ahmed, General Secretary, and Dilwar Hussain, Treasurer. 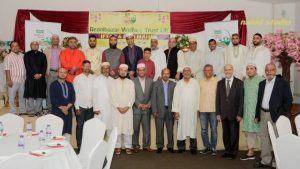 They said in a joint statement: “On behalf of the Beanibazar Welfare Trust UK, we would like to thank everyone for attending our annual Iftar gathering. It was hugely successful and your attendance meant a lot for us. We hope to meet you all again soon at our future events. “We would also like to extend our sincere gratitude to all the Board Members and other members of the trust for assisting us in making this a successful event. Special thanks go to Grand Rasoi for providing such a professional catering service.